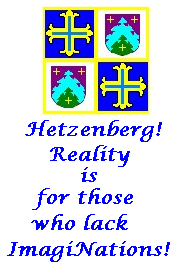 The Hetzenberg Chronicles: Maps and Other Matters. Due to a spyware infestation on my computer I lost all the computer-generated maps I'd drawn up for Hetzenberg. In a way this was a good thing. I found I was painting myself into a corner with regard to options for the mighty Duchy of Hetzenberg and its beligerent neighbor, the Margravate of Dunkeldorf-Pfuhl. Now I'm drawing up a new map - using old-fashioned hexagon paper and colored pencils. To some extent this method is similar to that found in Tony Bath's seminal "Setting up a wargames campaign." Each hexagon on the map returns a population figure depending on the prevailing terrain, and thus a given value of taxable income. From this comes the national military budget. As others on the Old School Wargames loop have noted, only a small proportion of the population can be called to arms before the economy begins to fall apart. The armies of Hetzenberg and Dunkeldorf are hardly going to be military leviathans in any case, and using this reasoning suits me just fine! At the moment I'm equivocal about what level of depth and detail to use in my campaign world. The 2nd Edition of "Warfare in the Age of Reason" rules by Tod Kershner and Dale Wood (Emperor's Press of Chicago) has a nice-looking campaign system called The Sport of Kings. It includes a neat set of seige-craft rules too, an essential in 18th century wargaming. So, a question (and a poll). What depth of campaign rules do you prefer? Deep, moderate, or superficial - or even "What rules?" When it comes to campaign background I like all three flavours (or 4 if you think of 'what rules'? as a system). If there are to be tabletop battles for all situations, or a boardgame to battle out the engagements that the 'campaign' calls for then I prefer the campaign system be very simple, only a movement system. If the tabletop or boardgame battles are only going to be used for 'selected' combats I prefer to have more 'chrome' in the campaign system so that the engagements that are not detail gamed out can at least have some resolution. If there are going to be only ONE tabletop battle resolved from the campaign system (or maybe TWO) with the system being used to maneuver the great armies about each other and establish where and when and with whom the 'great battle' will be then I should like the campaign system to be very intricate, so that the skirmish battles can have some value and ideally such a system would have a double-blind with a referee so that neither side has a clear picture of what is happening with the enemy troops (doubly so if good cavalry screens are established and a plan for deception is put into effect). This last was the first to be dropped (only books under a green cloth allowed to reproduce the selected map terrain), on the excuse that most of the time a battle occured where and when an army deployed on the morning and the opposition accepted the challenge. And we had a kind of RPG campaign in parallel, and some essential quasi-individual actions played at skirmish, almost RPG, scale (Siege of Dendermonde fashion)! So Icannot really comment on the topic - but a great motto! totally off-topic here, but I'm still 'surprised' : worried (?) by the the arrows pointed downward on the guidon of Rumtopft Dragoons... Looks... how to say it? Pessimistic? Unmanly? Ah, the arrows... Jean-Louis, far from being unmanly, the arrows in fact signify a readiness to do battle! When an archer of olden days made ready for action, he'd push a number of arrows into the ground point-first so they'd be quicker to load and fire. Part of the dragoon's heritage stems from a corp of mounted archers retained by an early Duke of Hetzenberg, and the downward pointed arrows relate to this. English longbowmen are indeed often pictured as you describe, in books about the HYW e.g. ; I confess to be more familiar with depiction of Ancient bowmen, generally -right or wrong- with their arrows still in the quiver. Now, what about the *enemy(ies)* of Hetzenberg, and their troops & flags?